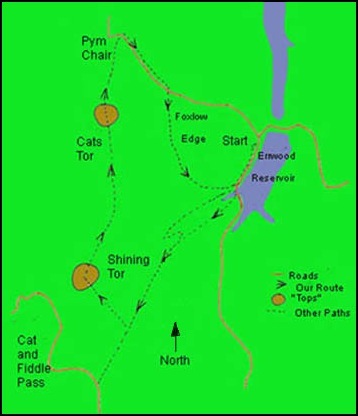 Walking from Erwood Reservoir to Shining Tor, Cats Tor and Pym Chair and returning via Foxlow Edge. companion that day, and I decided we had had enough when we reached the Cat and Fiddle Pass between Macclesfield and Buxton. The next "leg" of the walk would have taken us over Shining Tor and I suppose my wanting to go up it now was because I had not done it that day. Anne and I were having a weekend break near Wilmslow and with the Cheshire Hills not far away we decided to walk up Shining Tor. 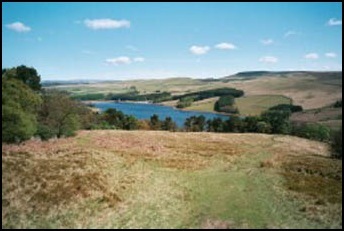 It was a beautiful day as we headed to the Goyt Valley and the car park by the Errwood Reservoir. 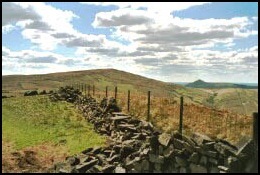 On the way there, via Bollington and Kettleshume, we were tempted to park by Pym Chair, a short distance from Shining Tor. 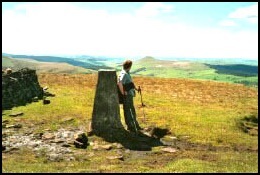 However, as this is in the region of 450 metres above sea level and as Shining Tor is only 559 metres the modest climb from this point would have felt like cheating. I therefore continued and drove down a narrow road to "Errwood". Anne was quite concerned about the ascent we were going to have to make from the car park by the reservoir which, when we reached it, was already well over half full. Good job we didn’t arrive much later as it was filling up very quickly. The May sunshine was obviously encouraging others to get walking. Boots on, walking poles in hands, we set off. Having not been to the Goyt Valley before we decided to go south along the west bank of the reservoir and enjoy the views and, having crossed Clough Bridge, we headed roughly south-west along a track that would eventually drop down to the "Cat and Fiddle". Initially it was quite steep but the further uphill we went the easier the walking became and looking back made the hard work very worth while with views down to the reservoir and across on to the moorland beyond. Visibility was excellent. We really had picked a good day. After about half a mile a path came in from the right, which had also started from the reservoir and had followed a stream uphill from the from the north side of the aforementioned Clough Bridge. Here Anne decided to stop to admire the views, get her breath back, and give a small group of other walkers, who had materialised up the other path, a chance to go in front of us. However, they didn’t seem to want to move so Anne and I continued uphill and on the brow of the slope turned right (north-west) to follow the track that was signposted "Shining Tor". 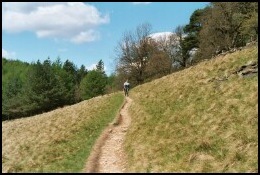 This was a very straight path, well maintained and within 10 or 15 minutes we were on the top of Shining Tor. Needless to say we were not alone. Other walkers were enjoying the superb views from the south-west side of the hill. Immediately below was the Cat and Fiddle Pass and two or three miles further south Shutlingsloe could be seen. Although not as high as Shining Tor, Shutlingsloe is a very impressive hill, and from our lofty position we admired its unmistakable outline. 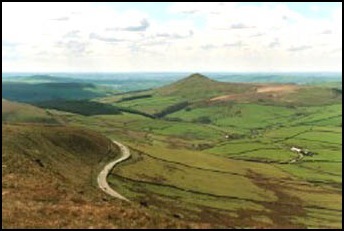 It is actually nicknamed the Matterhorn of Macclesfield and if you’ve seen it, particularly from Shining Tor, you will realise why. There was one seat on the top of Shining Tour and fortunately we were adjacent to it just as the previous occupants were leaving so we sat and had our elevenses - water and Snickers. As we sat there we watched the walkers who we had passed earlier climbing up the hill, and to Anne’s indignation one of them, a female, on reaching us said to Anne "Oh, you made it then". Just ‘cause we were probably 25 years older than her she obviously thought we were a little bit past it. – Anne "bit her tongue". Although at the start it had been very warm the sun went in as we started to walk again and it got quite cool. I even found myself putting on a thin pair of gloves. Amazing how the weather can change on the hills; even low ones. The path we followed from here went north following the top of the ridge to Cats Tor and then on to Pym Chair. This route goes over very peaty terrain, which would easily be eroded by walkers without actions being taken to prevent this. The solution was a carpet of some fibrous matting laid on the peat with stone chippings spread on top. It certainly seemed to work well and was very pleasant to walk on as the peat compressed as we walked on the "mat" and resulted in a very bouncy gait. You could actually see the chipping mat compressing as the person in front trod on it. 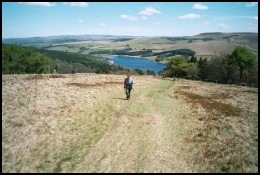 Once over Cats Tor it was downhill to Pym Chair and then right (east) and down the road back towards the Reservoir. However, about a third of a mile down the road we took a path to the right and started on a woodland path that took us below Foxlow Edge passing a small shrine on the way. This was very pleasant with native trees, oak, birch and rowen, mixing with spruce and pine. We enjoyed this path; however, others coming the other way were not all enjoying it as much as us. Two young girls (about 8 or 10) asked Anne, in very weary tones, "Is it far to the Shrine?". They were obviously not enjoying the walk as much as their parents who were some distance in front. I wonder if we were like that at their age? Soon after we emerged from the woodland near Clough Bridge and walked again along the road back to the car park. Here we rewarded ourselves with ice cream cornets. The walk had been just over 6 miles long and we had really enjoyed it.